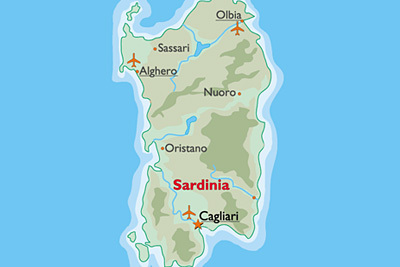 Sardinia has 3 main airports: one located in the west coast (Alghero 'Riviera del Corallo' - iata code AHO), one in the south (Cagliari 'Elmas' iata code CAG) and one in the east coast the famous 'Emerald Coast' or 'Costa Smeralda' as the Sardinian call it (Olbia - iata code OLB). The airports are very crowded when it's summer as you can see from this chart showing the number of passengers who visited the airports of Alghero, Cagliari and Olbia from 2010 to 2014. During the summer there are a lot of airline companies which connect Sardinia with the rest of Europe and among these we mention the lowcost Ryanair and EasyJet. The Olbia airport is located only 4 km from the city centre. The name Costa Smeralda or Emerald Coast is taken from the crystal waters of the area. There are flights available to and from Copenhagen, Prague, Barcelona and Milan, as well as major cities in many more countries of Europe. Olbia Airport is also used by a private aviation company for charter helicopter flights and maintenance services. The airport features five gates for boarding for added convenience and is a barrier free airport for passenger comfort, while a Meeting and Business Centre where office services and meeting rooms are available is an excellent addition for business users who can take advantage of internet services plus copying and faxing. There are a number of shops within the airport buildings for gifts and convenience goods including fine luggage and other items, and there are toy shops for children who are unsettled by the prospect of the journey. The airport also has a police station, full toilet facilities and ATM cash machines, as well as free public WiFi zones for passengers and other users of the airport. For passengers wishing to eat Olbia Airport is home to a choice of restaurants and bars; the Karakiosk Restaurant is a pleasant place to eat and features a garden area adjacent and serves a variety of dishes throughout the day, while the Wine Bar Karawine is a perfect place to sample the best of Sardinian wines and relax. There are also places to buy meals and snacks within the terminal building itself. For added convenience, in front of the main building is a luggage storage service open to passengers with a boarding pass and suitable identification, which can be used to leave luggage securely for a short time and for a small fee. The Cagliari airport is also known as 'Mario Mameli' and is located close to a village called Elmas, only 7 km from the city centre. The Alghero airport is located about 14 km from the city centre close to a village named Fertilia; sometimes this airport is referred as Alghero Fertilia and sometimes as Alghero 'Riviera del Corallo'. You may find the car rental counters in the arrival hall. At the Alghero airport you may find the follow car rental companies: Avis, Europcar, Hertz, Locauto, Maggiore, Ruvioli, Sardinya autonoleggio, Sicily by Car, Sixt and VitenGroup.